Neth is a JWOC Scholarship student in her second year of University, majoring in International Relations. In this blog post she reflects on the importance of learning both inside and outside the classroom. 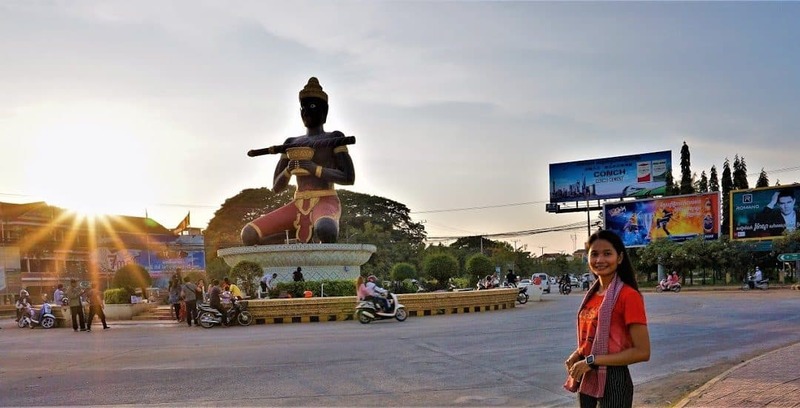 December 23, 2018 was such as a great Sunday to have a field trip for my “Philosophy and society & Philosophy and Buddhism” classes to Battambang province. This field trip gave me the chance to learn and experience new things in a different environment besides just attending class. There were 26 participants on that trip, which focused on debate, the Buddha monks’ presentation, mediation, and Philosophy’s got talent, which were so important. We left our university, Paññāsāstra University of Cambodia (PUC) in Siem Reap at 7:05am and had breakfast together at Tonle Sap restaurant until 8 o’clock, and then we started traveling to Battambang province by bus. As the professor had scheduled for us, the first activity was “Debate”, which started on board. The professor had assigned us into four groups, who were going to debate two different topics. The first topic was “Do good receive good, do bad receive bad”, which was debated on the way to Battambang, and the second topic was about how “No one can isolate themselves from the society,” which was debated when returning to Siem Reap. The first topic was debated by my group as the defense, with another group as the offense. While we did that debate, we used what we had learned in the class to practice. The debate was not only a great time to share each other’s ideas but it also built up my confidence and improved my flexibility on question and answering. That was such a great and challenging part of that field trip and after that we had some entertainment such as listening to music and singing together. After spending about four hours traveling, we arrived at Battambang province, and we had a very nice lunch at Banon mountain with a fresh and beautiful landscape surrounding. The environment made me feel relaxed, and I also noted that my other friends looked joyful. We spent over an hour for lunch and took some photos together. Then we went to see and feed the beautiful fish at Together Feeding Fish For Community Development near the mountain, which made me feel wonderful. By following the schedule, at 2 pm, we left the Banon mountain to continue to the Buddhist for Education of Cambodia (BEC), which was the main place of the field trip where we could learn more. We arrived at BEC at around 2:30pm, and we received the presentation from the Buddhist monks there. They provided us with an awesome presentation on the topic of the “Buddhist concept on Three Universal Characteristics as applied for daily life.” The presentation was great as I could get a better understanding of what I had learned in the class. After the presentation, we given books by the monks to learn even more. 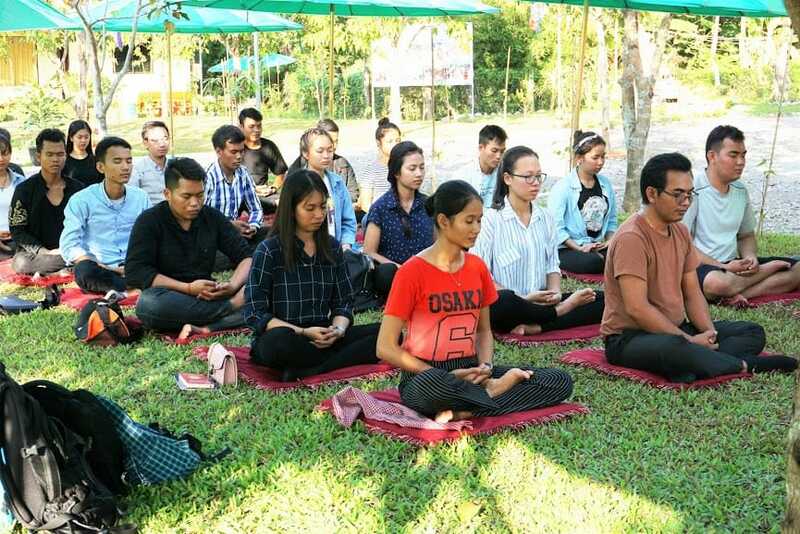 When the presentation was finished, we learned how to meditate, which is really important to apply in our daily life. Meditation makes us feel relaxed and gain peaceful-mind, which we need for our life. Joining the activities and learning at BEC was wonderful as I could gain more knowledge and experience which I could apply to my daily life. At around 4:30pm, the learning session and activities at BEC had finished, and we all thanked the monks and took the bus back to Siem Reap. We also spent about 15 minutes to visit and prayed for returning safely at Lok Ta Dambang Krornhuong, which is the main part of Battambang province. On board while we were traveling back to Siem Reap, we debated the topic: “No one can isolate themselves form the society.” Then the professor gave us feedback on our debate of the both topics. During every activity, the professor noted and gave us a score to support our reflection after the trip, so we had to be active and curious. Even though the deba te had finished, there was still another activity for us to do: the Philosophy’s Got talent, which was fun and let us learn more about each other as everyone has different talents. It was also my time to be the Mic Controller. I felt so happy and will not forget that field trip because I got to learn and share, debate and even control the Mic. Finally, we arrived at Siem Reap safely at around 9pm. At the end of the field trip, I felt a bit tired, but full of experience and joy. 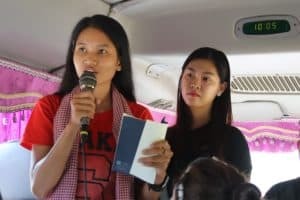 To sum up, the field trip to Battambang was an important, great experience and one of my unforgettable moments in2018. I not only felt relaxed and happy about a different learning environment, but I also gained more knowledge about the “Buddhist concept on Three Universal Characteristics as applied in daily life”, debate, meditation, Philosophy’s got talent and my peers. I am sure, I can apply this knowledge and experience in my daily life.